Home > CDW Quantum > Case Study: Saving Time and Files. 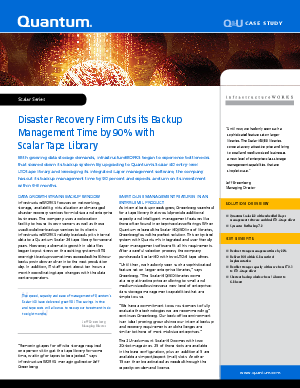 Case Study: Saving Time and Files. This case study profiles how infrastructureWORKS used Quantum's Scalar i40 entry-level LTO tape library to cut its backup management time by 90%. And how the company estimated that it could recoup its initial investment in the data backup technology in as little as six to eight months.